Sobha was facing East. She walked 20 metres. Turning left she moved 15 metres and then turning right moved 25 metres. Finally, she turned right and moved 15 metres more. How far is she from her starting point. Shobha turns left after walking 20 metres towards East. Now she walks 15 metres towards North. She turns right towards East again and walks 25 metres further. Finally turning right towards South, she walks 15 metres. The distance moved towards North and towards South is same, i.e., 15 metres. So, Shobha is 20 + 25 metres = 45 metres away from her starting point. Jatin leaves his house and walks 12 km towards North. He turns right and walks another 12 km. He turns right again, walks 12 km more and turns left to walk 5 km. How far is he from his home and in which direction ? Deepak starts walking straight towards east. After walking 75 metres, he turns to the left and walks 25 metres straight. Again he turns to the left, walks a distance of 40 metres straight, again he turns to the left and walks a distance of 25 metres. How far is he from the starting point ? The movements of Deepak are as shown in fig. Clearly, FB = DC = 40 m .
= (AB – EB) = (75 – 40) m = 35m. The movements of the person are from A to F, as shown in fig. Clearly, the final position is F which is to the north east of the starting point A.
Ramakant walks northwards. After a while, he turns to his right and a little further to his left. Finally, after walking a distance of one kilometre, he turns to his left again. In which direction is he moving now ? The movements of Ramakant are as shown in fig. Ram is facing South. Ramesh, walking towards him, stops, and turns to his right. He sees Umesh standing before him facing him. Which direction is Umesh facing? Saroj started walking straight, facing West. After walking some distance she took a left turn and again after walking some distance she took a left turn. Which direction is she facing now? Raman starts from point P and walks towards South and stops at point Q. He now takes a right turn followed by a left turn and stops at point R. He finally takes a left turn and stops at point S. If he walks 5 Kms before taking each turn, towards which direction will Raman have to walk from point S to reach point Q? So, Raman will have to walk in North direction to reach point Q from point S.
Ravi wants to go to the university. He starts from his home which is in the East and come to a crossing. The road to the left ends is a theatre, straight ahead is the hospital. In which direction is the university? A rat runs 20’ towards east and turns to right, runs 10’ and turns to right, runs 9’ and again turns to left, runs 5’ and then to left, runs 12’ and finally turns to left and runs 6’. Now, which direction is the rat facing? The movements of rat are as shown in figure. Clearly, it is finally walking in the direction FG i.e. North. A and B start walking, from a point, in opposite directions. A covers 3 km and B covers 4 km. Then A turns right and walks 4 km while B turns left and walks 3 km. How far is each from the starting point ? Here, O is the starting point. = 5 km from the starting point. Anuj started walking positioning his back towards the sun. After sometime, he turned left, then turned right and then towards the left again. In which direction is he going now? From her home, Prerna wishes to go to school. From home, she goes towards North and then turns left and then turns right, and finally she turns left and reaches school. In which direction her school is situated with respect to her home? 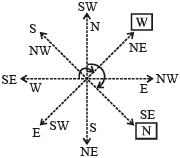 It is clear from the diagram that school is in North-west direction with respect to home. One day, Ravi left home and cycled 10 km southwards, turned right and cycled 5 km and turned right and cycled 10 km and turned left and cycled 10 km. How many kilometres will he have to cycle to reach his home straight? Here, Ravi starts from home at A, moves 10 km southwards up to B, turns right and moves 10 km up to C, turns right again and moves 10 km up to D and finally turns left and moves 10 km up to E.
= (5 + 10) km = 15 km. Rasik walks 20 m North. Then, he turns right and walks 30 m. Then he turns right and walks 35 m. Then he turns left and walks 15 m. Then he again turns left and walks 15 m. In which direction and how many metres away is he from his original position? The movements of Rasik from A to F are as shown in figure. Since CD = AB + EF, so F lies in line with A. = (AG + GF) = (BC + DE) = (30 + 15) m = 45m. Also, F lies to the east of A.
Rohit walked 25 metres towards South. Then he turned to his left and walked 20 metres. He then turned to his left and walked 25 metres. He again turned to his right and walked 15 metres. At what distance is he from the starting point and in which direction? The movements of Rohit are as shown in figure. = AE = (AD + DE) = (BC + DE) = (20 + 15) m = 35 m.
Also, E is to the East of A.
I am facing east. I turn 100° in the clockwise direction and then 145° in the anti-clockwise direction. Which direction am I facing now? As shown in figure, the man initially faces towards east i.e., in the direction OA. On moving 100° clockwise, he faces in the direction OB. On further moving 145° anticlockwise, he facings the direction OC. Clearly, OC makes an angle of (145° – 100°) i.e. 45° with OA and so, the man faces in the direction North-east. A man is facing north-west. He turns 90° in the clockwise direction, then 180° in the anti-clockwise direction and then another 90° in the same direction. Which direction is he facing now? As shown in figure, the man initially faces in the direction OP. On moving 90° clockwise, he faces in the direction OX. On further moving 180° anticlockwise, he faces in the direction OY. Finally, on moving 90° anticlockwise, he faces in the direction OZ, which is South-east. A man is facing west. He runs 45° in the clockwise direction and then another 180° in the same direction and then 270° in the anti-clockwise direction. Which direction is he facing now? Here, R faces towards West. S is to the right of R. So, S is facing towards South. Thus, Q who is the partner of S, will face towards North. One morning after sunrise, Gopal was facing a pole. The shadow of the pole fell exactly to his right. Which direction was he facing? The Sun rises in the east. So, in morning, the shadow falls towards the west. Now, shadow of pole falls to the right of Gopal. Therefore, Gopal’s right side is the west. So, he is facing South. One evening before sunset two friends Sumit and Mohit were talking to each other face to face. If Mohit’s shadow was exactly to his right side, which direction was Sumit facing? In the evening, sun is in the west and so the shadows fall towards east. So, Mohit’s shadow fell towards east. Now, since Mohit’s shadow fell towards right, therefore, Mohit is facing North. So Sumit, standing face to face with Mohit, was facing South. One morning after sunrise, Reeta and Kavita were talking to each other face to face at Tilak Square. If Kavita’s shadow was exactly to the right to Reeta, which direction Kavita was facing? In morning, sun rise in the east so shadow of a object falls towards the west. Now, kavita’s shadow falls to the rights of Reeta. Hence, Reeta is facing South and Kavita is facing North.